Before getting into details, some disclaimers and explanations. I assume that if you want to install Devstack, it's because you're interested in being a contributor to OpenStack development or because you just want to play with the code. Devstack is a shell script that builds an OpenStack development environment for people developing OpenStack; it's not meant for production. I install Devstack and Ceilometer on a virtual machine. Why use a virtual machine? It's the recommended way to install Devstack. Cloud infrastructure software is complex. Devstack installs lots and lots of dependencies, and you probably don't want all those dependencies to be installed on your everyday environment. Moreover, if Devstack or Ceilometer breaks (which happens pretty regularly when you develop), it's a lot easier to start over from scratch if you're working in a virtual machine. You can simply destroy the old virtual machine and build a new one, without any effect on your everyday environment. I'm using Vagrant because it was recommended to me, but there are plenty of other ways to run virtual machines. You are welcome to use your own method, but this post will only explain how to setup virtual machines using Vagrant. Finally, note the date of this post. Devstack and Ceilometer are rapidly being developed, and this information could become deprecated very quickly. Vagrant is software for building and distributing virtual development environments. It works with many virtualization software packages. By default, Vagrant uses VirtualBox for its virtualization software package. First, install VirtualBox. Follow the instructions on the VirtualBox Linux downloads page. Now you need to pick a "box." 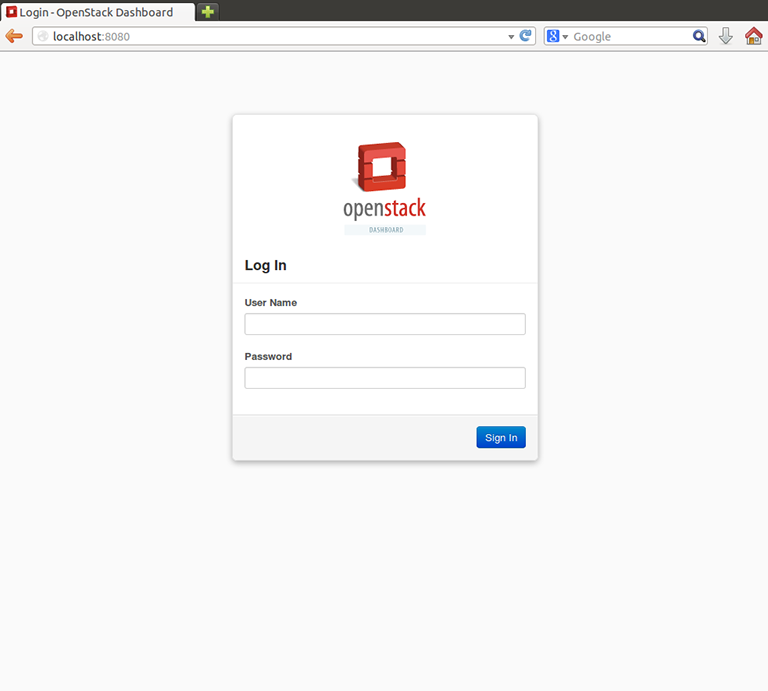 Vagrant uses "boxes" as the base image for creating a virtual environment. A box is based on a specific operating system possibly with additional software and configurations. Vagrant has official bare-bones Ubuntu boxes, and there are also many other unofficial boxes at the community page located at www.vagrantbox.es. A 64-bit OS is preferred, so that you can assign more RAM to your VM. Note that since we are running a 64-bit guest machine on VirtualBox, you need to make sure that hardware virtualization is enabled on your host machine. This may require you to access your machine's BIOS settings. This creates a Vagrantfile in the directory where your Vagrant VM will be managed. The Vagrantfile is the configuration file for your Vagrant VM. If you don't have the matching lines, then manually copy and paste the above line to the Vagrantfile. We are using port 8080, but you can use another port, as long as it isn't being used by another process. 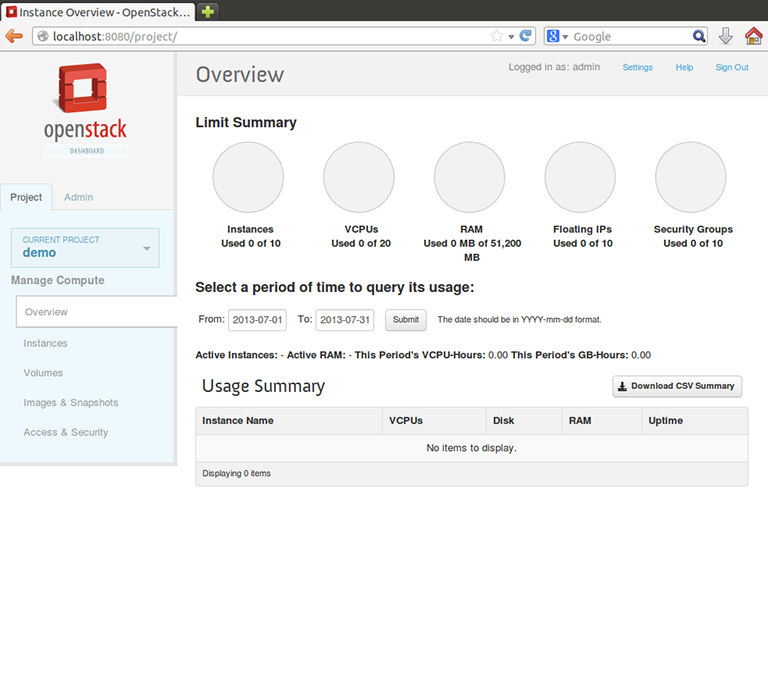 We will need port forwarding later to check that Devstack is working properly. The recommended amount of RAM for Devstack is at least 2 GB. However, the default RAM in a Vagrant VM is 360 MB, so we need to change this. My laptop I work on has 8 GB RAM, and it works fine running a 2 GB Vagrant/VirtualBox VM. Here is a sample Vagrantfile that configures both port forwarding and 2 GB RAM. If you see a different number, check your Vagrantfile. This file localrc allows you to configure user-defined variables in the stack.sh script which installs Devstack. Now you are ready to install Devstack and Ceilometer! This is a CPU intensive process, so don't run any heavy programs in the background. Input a password as directed and sit back as everything is installed for you. It took about 30 minutes to install on my own VM. The Ceilometer GitHub repository will be cloned to your /opt/stack/ceilometer directory. If for whatever reason you already installed Devstack but have not yet installed Ceilometer, no problem. You don't have to create a new VM. Skip down to the part in the instructions where it says you should begin if you previously installed Devstack. If you have any problem whatsoever while running ./stack.sh, it is a good idea to check the logs in the directory /opt/stack/logs. The screen output from running ./stack.sh is saved there and the logs have names like stack.sh.log.<date>. The most recent log is saved in the file stack.sh.log. For more info, see the "stack.sh logging" section in the Devstack stack.sh documentation. This is a bug I've encountered, but it should be fixed now. If you are using Ubuntu 12.04 (like we are in this guide), as of this writing,the MongoDB packages for Ubuntu 12.04 are too old (< 2.2). In that case, install the 10gen version mongodb-10gen by following the instructions here. To login, provide the username admin and the corresponding password which can be found in the ADMIN_PASSWORD variable of your localrc file. Go to the project page at http://localhost:8080/project/ and you should be able to see quotas like Instances Used 0 of 10, VCPUs Used 0 of 20, RAM Used 0 MB of 51,200 MB, etc. including nova, glance, ceilometer, etc. If the line does not exist, add it to the file. We can check that Ceilometer is collecting data by starting up the MongoDB shell, connecting to the Ceilometer database, and examining the data. and leave you at the prompt. You should get a number greater than 0; I got 19 samples. As time goes on, the number will increase. The Ceilometer documentation glossary defines some of these terms "meter", "project", "resource", "user". These indexes speed up searching and sorting on MongoDB data. Type exit to leave the MongoDB shell and return to bash. For more information about MongoDB shell commands, see the official MongoDB documentation. This will take a while. On my VM, the tests took 10 - 15 minutes to run. 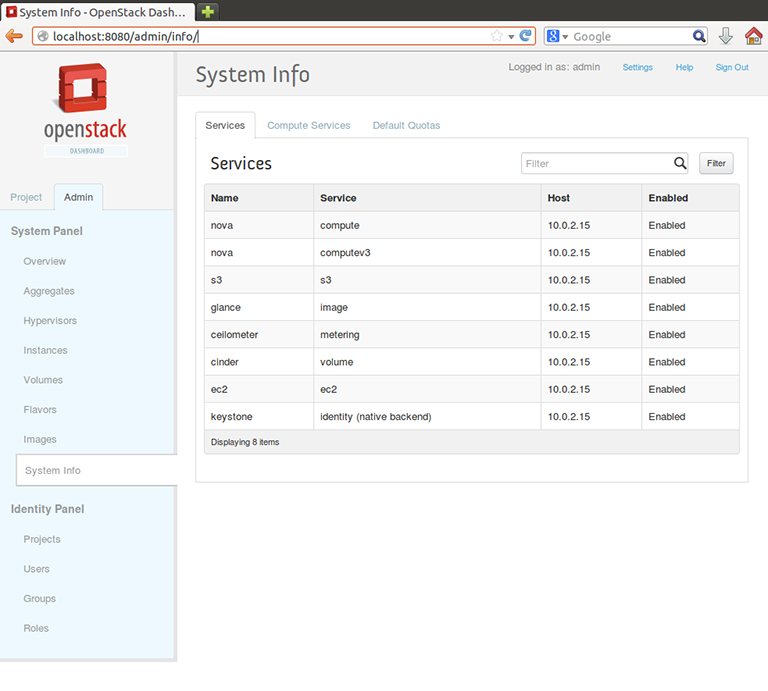 The OpenStack dashboard is working, Ceilometer is collecting samples, and the unit tests pass. Congratulations! You have a working Devstack and Ceilometer! The Ceilometer unit tests are run using testr (manual here). Here we're running the test_get_meters_by_metaquery test for the MongoDB storage driver. Anything after -- is treated as an argument for testr. Each argument is treated as a regular expression. That leads to an interesting scenario. the following tests will be executed -- test_get_meters, test_get_meters_by_user, test_get_meters_by_project, test_get_meters_by_metaquery, test_get_meters_by_empty metaquery -- because they all start with test_get_meters and are counted as matches by the regex filter. then your MongoDB version is too old and you need to install MongoDB packages that are version 2.2 or higher (this is the current requirement for Ceilometer). This can take anywhere between 15 minutes to an hour depending on the configuration. I've mentioned some references to documentation along the way, here's a summarized list of them, plus a couple more. This is v2 of the documentation for Vagrant. However, I sometimes find it helpful to look at the deprecated documentation for v1. The v1 documentation sometimes contains details that are not present in the v2 documentation and yet are still applicable to the latest version of Vagrant. The Vagrant commands I use most often are vagrant up (boot up the VM), vagrant ssh (ssh into the VM), vagrant init (create a Vagrantfile in preparation for making a new VM), and vagrant destroy (permanently destroy the data I've accumulated while working in the VM).